First time I read "The Gospel in a Pluralist Society" was in 2003, and now I have completed my second reading. A lot has changed in my experience and comprehension since my initial reading, and there are things I picked up this time I didn't before. Since there are loads of reviews of the book filling the virtual pages, I'll simply point out a few of the highlights I enjoyed being reminded of in my second reading of the book. 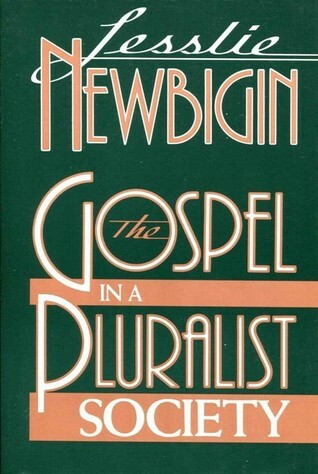 To begin with, Newbigin sought to practice what he preached. This book came toward the latter end of his life and service as a missionary to South India, as well as his work in the ecumenical movement. He brings his talented perception to bear on the mission field of the West, and primarily the West shaped and formed by the Enlightenment. Primarily the greater part of the book is helping the reader to learn to be suspicious of the hermeneutics of suspicion. He does this by challenging the the bifurcation between "facts" and faith, reason and revelation. "There is no knowing without believing, and believing is the way to knowing. The quest for certainty through universal doubt is a blind alley" (33). Next he spends time tackling how a "revolution of expectations" (130) shapes a Christian view of the future, in contrast to the lack of expectations arising from modern Western culture. For example, after describing two temptations churches can fall into – (1) when things fall apart thinking it’s the end of the world; or (2) tumbling into comfortability – Newbigin goes on to say; “Against both of these temptations the New Testament warns us with its insistent call for a patient hope, a hope which is – on the one hand – confident and sure, an anchor of the soul, and on the other hand patient and enduring. These are two sides of the same thing. Impatience is a sign of unbelief. Firm belief in the one who has promised will lead to patient endurance. That, I suggest, is the central thrust of the New Testament’s teaching about what we can look forward to…Once again we must remember that responsible human action is not possible without some vision of the future” (109). This theme, it appears to me, shapes much of the program Newbigin maps out for the church in a pluralist society, along with the durable posture that Christians should have arising from this program. Finally, the last half of the book addresses how the church in a pluralist society needs to see itself as a mission church, and what that means. Though most of his topics here cover the why and how of living and breathing and moving as a missionary church, it is rarely an idealistic and academic abstraction. In the end, he sees the local congregation as the platform of real change; "It will only be by movements that begin with the local congregation in which the reality of the new creation is present, and experienced, and from which men and women will go into every sector of public life to claim it for Christ, to unmask the illusions which have remained hidden and to expose all areas of public life to the illumination of the gospel" (232-3). Sign into Goodreads to see if any of your friends have read The Gospel in a Pluralist Society. 5.56% "Re-reading this old friend." 33.73% "Great to return to this book. Thoughtful and perceptive!"